H.D. SMYTH. 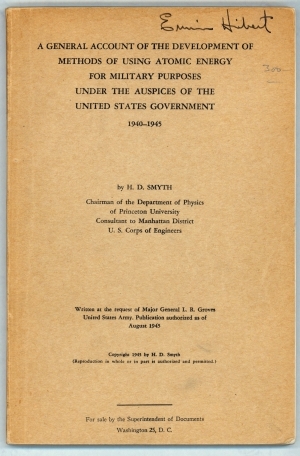 A General Account of … Using Atomic Energy for Military Purposes Under the Auspices of the United States Government 1940-1945. Written at the Request of Major General L. R. Groves, United States Army... Washington, DC: Superintendent of Documents. (1945). Book, 1945. 182 pp, illus. with 2 graphs. With ownership signature of “Erwin Hiebert” twice. For more images on this item, please contact us at info@sethkaller.com.